At Five Points Eye Care Center, we strive to go beyond simple day-to-day business practices by taking opportunities to benefit our community through efforts of kindness and donation of time and materials. Our office does so by several means. We accept donated eyewear to be fitted both locally and internationally. Our doctors participate in InfantSee, a program sponsored by the American Optometric Association to provide free comprehensive eye examinations to infants under the age of one. They also perform free examinations through Vision USA and Lions Club International, programs that provide examinations to children and needy adults at little or no cost to them. Our practice has partnered with Nuci’s Space, a non-profit health and music center with a special emphasis on suicide prevention for area musicians. All of our doctors have traveled to Central and South America to provide free eye care and glasses to people in remote or poor parts of those countries. One of the most rewarding things our office does is to foster outreach programs in our local community that offer assistance to less fortunate people. Our doctors and staff provide free eye care and glasses at a clinic in North Athens operated by The Sisters at the Oasis Catolico Santa Rafaela, which supports underprivileged immigrants. They also volunteer their time to give free eye care at the Mercy Health Center, a non-profit community health center. Our doctors routinely volunteer their time to lecture to many different groups in the Athens area including senior centers, the Athens Clarke County library, blind support service centers, local schools, and diabetes wellness classes. Our doctors and staff also perform vision screenings at community health fairs. Our office provides free vision screenings to hundreds of children at elementary and preschools every year. Our practice sponsors many Athens area volunteer organizations including the Athens Oconee Junior Woman’s Club, The Athens Kiwanis Club, Friends of Five Points, and the Taste of Athens which benefits Community Connection of Northeast Georgia. 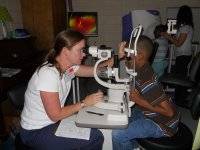 Five Points Eye Care Center has been able to provide thousands of needy individuals with free eye care and glasses over the years and are grateful to be able to give back to our community in many different ways.